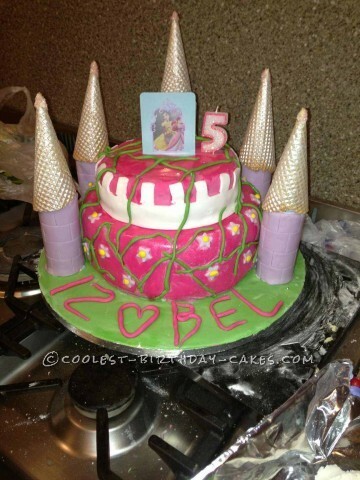 My daughter asked for a princess castle birthday cake for her 5th birthday. I’ve made a few cakes for family previously but only a Victoria sponge with fondant icing on and just a few decorations. I knew it would be a big task but really wanted to do it for her. I started at 10am by greasing/papering a 9 inch round tin and 2×7 inch round tins, then I made the batter mix for the 9 inch which consisted of 18oz marg, caster sugar and self raising flour, creamed the marg and sugar together then added 5 eggs with the flour (half then half again) and 1 tbsp of baking powder. Once the consistency was of what I thought right I poured the batter mix into the tin making sure I made a small well in the middle so it wouldn’t rise to a peak. I popped it into the oven for 1 hour 20 mins on 160 (for fan oven). Whilst that was cooking I made the batter for the 7 inch cake ( in amongst tidying the mess I’d already made) that consisted of 4 self raising flour, 4 marg, 4 sugar and 2 eggs. This is only a small amount of batter as I didn’t want the top tier to be too heavy. Again the same method used and put into the oven for 25 mins. While the cakes where cooling I started on the butter cream, I used 1kg of icing sugar and 1lb of butter, creamed the butter till it looked pale in color then gradually added the sifted icing sugar, one tbsp at a time. Once cooled I cut the bigger cake into two and jammed and creamed the inside, and did the same to the smaller cake, I also put the butter cream on the outside of the cakes then put them into the fridge for around 30 mins. I rolled out the green icing to put on the board and trimmed it all round, placed that into the fridge to cool and harden. Meanwhile I got a piece of plastic tube and cut (well got my husband to saw) it into 4 4inch pieces and 1 7inch tall piece. I then covered the smaller 4 with lilac fondant icing and the bigger one in pink fondant icing, then added the brick effect with a knife, placed them into the fridge to harden. For the turrets I got some waffle cones and sprayed them with shimmer spray and dipped the ends into the butter cream then into some pink glitter. Once the sides where clear I started to roll out the pink icing for the smaller cake, then carefully lift from worktop I molded it around the cake, flattening as I went. After this I covered a small board in pink icing (5inch). I then placed the cake onto the smaller board then back into the fridge. Getting the larger cake out I did the same with the pink icing but this time the cake was already on the green board. I then placed 4 dowels into the cake making sure they would support the upper tier. With both the cakes now in the fridge cooling, I started to make the decorations – just a star small cutter for the lilac stars and a blob of yellow icing for the middle bit, and rolled in my hands green to make the vine. White icing for the castle edge, measured around the cake to get the right length and cutting out the bricks. The cake was put together then I decorated it and titivated around it for a while till I was happy. I’m very proud of this cake.